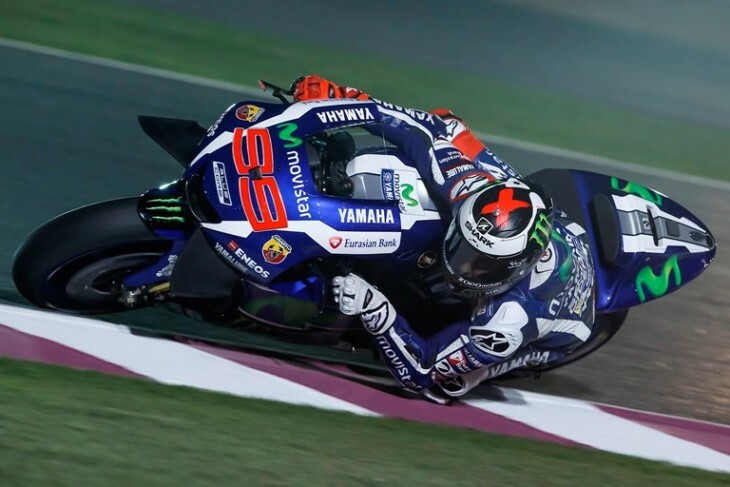 The Movistar Yamaha MotoGP Team concluded the final day of Official Testing at the Losail International Circuit in Qatar with strong results for both sides of the garage. Jorge Lorenzo let his consistency see him through and set the fastest time of the day, claiming top billing in the combined time sheets. Valentino Rossi also kept his key protagonist status elevated as he finished his pre-season campaign with a positive fifth place in today’s ranking order, leaving him in the same position in the combined times. Today Movistar Yamaha MotoGP riders Jorge Lorenzo and Valentino Rossi completed the third and final day of the final Official MotoGP Test of the 2016 pre-season. In contrast to previous testing opportunities, over the last three days both riders were able to enjoy a good amount of dry track time and were able to work through a number of potential new items for the 2016 YZR-M1. Lorenzo delivered his trademark top-level of focus from day one and never strayed far from the front. Today the Mallorcan hit the top of the running order once more when he dipped under the Circuit Record Lap of 1’55.153s with a 1’54.810s lap and became the only rider to go under the 1’55s over the entire three-day test. He went on to complete a long run this afternoon to wrap up the test in first place in the combined standings with a 0.516s margin over his closest rival. Teammate Rossi continued his strong form during pre-season testing as he laid a final hand to the setting of his YZR-M1. After a small crash in turn ten, which left the Italian unhurt, he improved on his fastest time set on the first day by nearly half a second, posting a 1’55.429s, and finished the day in fifth place just over 0.6s from teammate Lorenzo. Thanks to the progress he made today he also secured fifth position in the combined times, leaving him in a strong place to start the 2016 MotoGP season at the first round in Qatar from March 18th – 20th. Monster Yamaha Tech3 team riders Pol Espargaro and Bradley Smith completed the final preseason run out today with encouraging performances which leave them confident for the approaching first race of the 2016 MotoGP World Championship in Qatar. Pol Espargaro brought his test campaign to a positive close as he carried on his thorough work with the electronics as well as the Michelin tyres. In addition, the Spaniard was also one of the few riders to undertake a full race simulation today and ultimately, he cut 0.865 from his fastest lap from day one, which was just over half a second from 2nd overall. Meanwhile, Bradley Smith dug deep as he completed a mammoth 62 laps, whilst continuing in making alterations to his Yamaha YZR-M1. The end result saw the confident Briton finish just 0.084 behind his teammate, leaving him optimistic of his ambitions to complete the opening Grand Prix inside the top 8.